The above illustration was a cover for a new magazine client, Chemical Engineering Magazine. 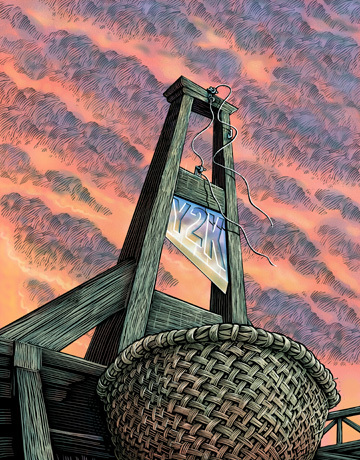 A nice illustration, however hamstrung by the ‘label’ on the guillotine blade. A lot of the illustrations in this posting are rather dated, and cover topics that are barely even remembered today. The Y2K scare, the short lived Russian Prime Minister pictured to the left (quick, anyone remember his name? ), Monica Lewinski and Linda Tripp, etc etc. 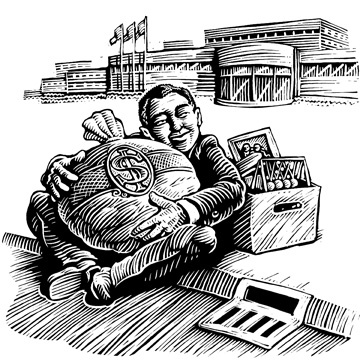 A lot of the illustrations around this time make me cringe, and I’m sure that ten years from now, the work I’m doing today (’08 when I wrote this) will do the same. A healthy thing, I suppose, as it probably means I’m not going stagnant. 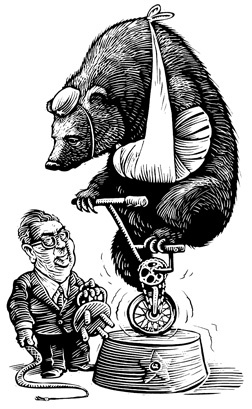 The ‘russian bear’ illustration to the left was for Newsday, on a same day basis. The bear’s not bad, and the likeness of the PM is pretty good, but the body, wip and chair are kind of awkward. 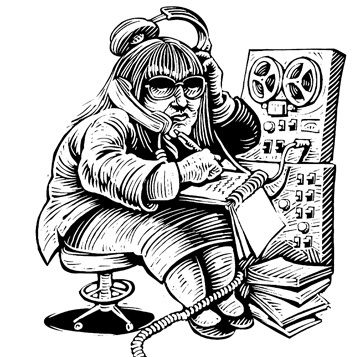 The caricatures of Linda Tripp and Monica Lewinski were for Legal Times. 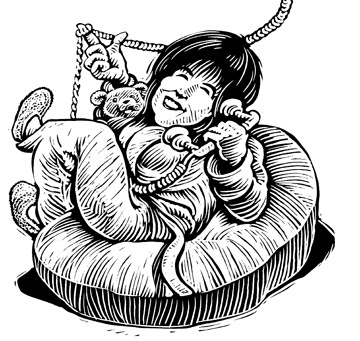 These originally were part of one big illustration, with Linda in the upper right and Monica in the lower left of the page, with the phone cord snaking through the text connecting the two. The likenesses and layout were fairly decent on this one, considering the age of the thing, although I seem to be fudging the hands and clothing. Above was another full page illo for Legal Times. Sometimes a job comes across my desk with the idea already worked out by the editors/designer, and there’s little for me to do but try and bring it to life. I’m never quite happy with these sorts of assignments, the end product frequently looks stiff and lifeless. Both the illustration above and the illustration below (for The Recorder) were handed to me in this way. The image below was something to do with an ex baseball player who was going through some sort of legal difficulties at the time with a certain brewery’s ad campaign. 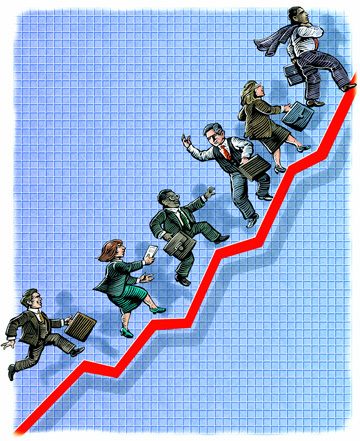 The illustration below that was another for Legal Times, something about huge severance packages. 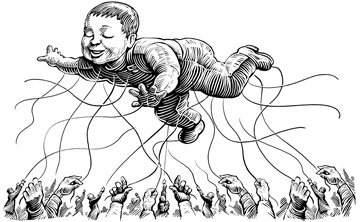 The ‘balloon baby’ below was for the Chronicle of Higher Education. This one was no doubt something to do with Hillary Clinton’s ‘It Takes a Village’ book. 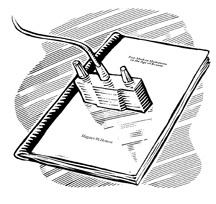 The ‘online term paper’ image to the left was another for the same client this month. Below that, is an illustration to accompany an article about the Ken Burns’ documentary about Lewis and Clark, which was making a debut on PBS around this time (for Newsday).